A3+ Size 16.5 x 11 in. (420 x 278 mm) 19 x 13 in. SMALL 15 x 10 in. (381 x 253 mm) 18 x 12 in. MEDIUM 21 x 13.9 in. (533 x 354 mm) 24 x 17 in. This sepia-toned narrative painting depicts the final moments in the life of the Buddhist King, Dharmaketu, who died at an early age. This sad legend was first illustrated by the great Newar artist Siddhimuni Shakya, who made two small versions of this composition during the course of his life, the first in black and white, and the second in colour. Siddhimuni's original Sanskrit inscription for this painting stated: "Sri Dharmaketu Maharaja's life has ended and he is about to die. Yamaraja and Chitragupta pray to the Buddha, Prajnaparamita, Arya Avalokiteshvara and Arya Tara, requesting them that the king be taken away from this world of samsara." Dharmaketu, the 'banner of the dharma', lies dying on his bed in his royal palace, the decor of which resembles one of Kathmandu's Rana palaces that were built in the early 20th century. 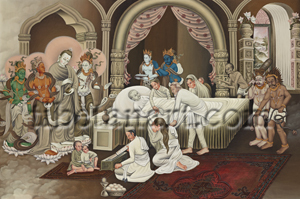 The court physician (vaidya) leans on the bed behind the dying king and takes his pulse with his right hand, while Dharmaketu's white-haired father, Suketu, leans forward in front of the bed and gazes at his son with deep concern. At the back of the bed is Dharmaketu's sister, with her young son behind her, who both likewise gaze at the king with grief and despair. Kneeling in front of the bed is Dharmaketu's wife, who tearfully buries her face in her hands as the king's father touches her shoulder in comfort. Seated before a small wooden table to the left of Dharmaketu's wife is the palace priest or vajracharya, who recites from a sacred text as he performs a long-life ritual for the king, with a butter-lamp and a bowl of fruit near him. And seated on a small carpet in front of the priest are the king's two children, with the elder daughter bravely trying to comfort her younger brother, Prince Satyaketu, who is soon destined to inherit his father's throne. Standing behind the bed and petitioning the Buddha with folded-palms is blue Yamaraja, the 'King of the Dead', who requests that Dharmaketu be taken directly from this world of suffering to enter the state of nirvana. To the right of Yama is Chitragupta, the scribe of Yama, who records the good and bad deeds of all men in his 'Book of Life'. Chitagupta, the 'mind of secrets', likewise petitions the Buddha to release Dharmaketu from the cycle of samsaric existence, as he holds open the titled page of the book that records all the virtuous deeds the king has performed during his short life. At the foot of the bed are two of Yama's dark and fearful messengers (yamaduti), who obediently wait for death's final judgment to be passed on the king as they hold their attributes of karmic retribution, a heavy wooden club and a rope-snare. Creeping stealthily behind them at the foot of the bed is the shadowy and emaciated form of a hungry ghost or preta, who reaches towards the king as he tries to draw him into his shadowy realm. Standing upon lotuses that float above wispy clouds at the head of the bed is the tall form of Shakyamuni Buddha and his three attendant Bodhisattvas, who all gaze adoringly towards the Buddha. To the Buddha's left is Avalokiteshvara, the white Bodhisattva of boundless compassion, who wears his characteristic antelope-skin draped over his left shoulder. He holds the stem of a lotus in his right hand, and makes the gesture of dispelling fear towards Dharmaketu with his left hand. Standing to the Buddha's right is the golden-red goddess Prajnaparamita, who embodies the 'Perfection of Wisdom', and she gracefully holds her hands in the gesture of meditation as she gazes toward the Buddha. Behind Prajnaparamita is Arya Tara, the green goddess of mercy and salvation, who holds the stem of a white utpala lotus in her right hand. The Buddha serenely stands with his head slightly inclined and his gaze full of deep compassion, as he gracefully lifts his right hand above his alms-bowl in the sublime gesture of releasing King Dharmaketu's spirit from its earthly bonds.